For sure, 2015 has been an exciting year for Milan; indeed, along with the World’s Fair, two major cultural venues inaugurated this year in the city: the Mudec – Museum of Cultures and, in May, the new Fondazione Prada, designed by the international firm OMA, led by the Dutch architect Rem Koolhaas. 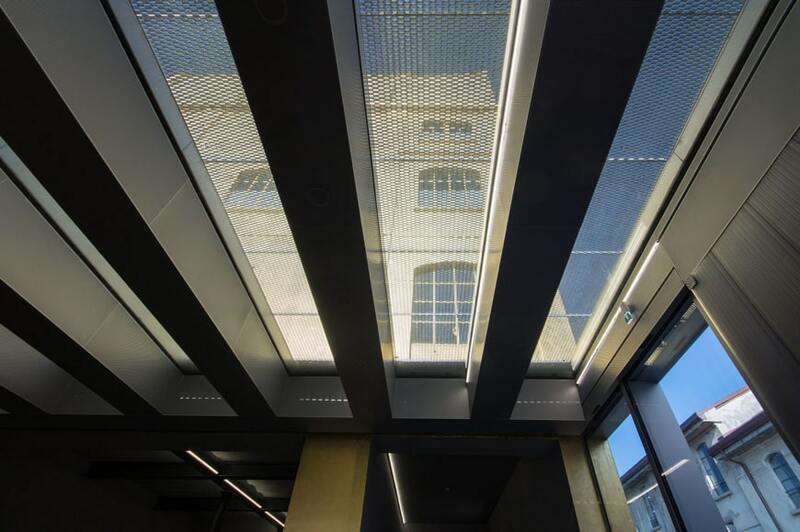 The Prada Foundation is committed since 1993 in promoting contemporary culture by organizing exhibitions and events covering visual arts, cinema, dance, architecture, and philosophy. 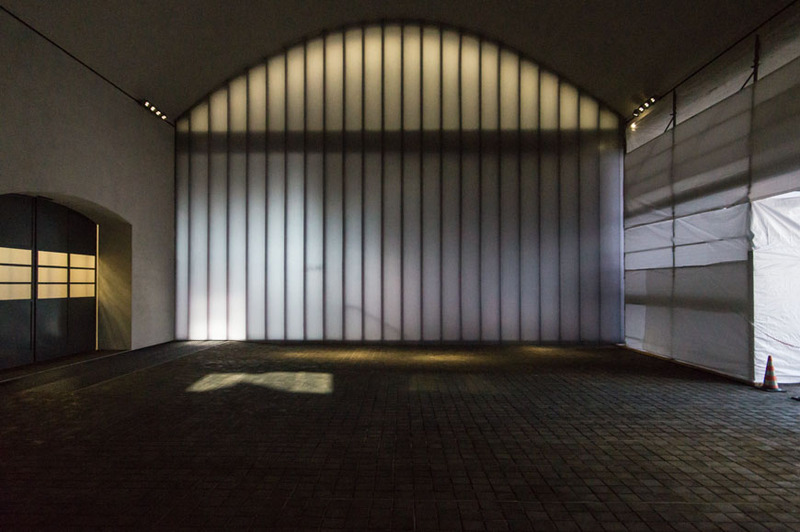 The Prada Foundation’s activities, hosted in various venues including the Prada Foundation in Venice, have featured the visions by artists, designers and intellectuals such as David Smith, Anish Kapoor, Louise Bourgeois, Dan Flavin, Laurie Anderson, Mariko Mori, Marc Quinn, John Wesley, Enrico Castellani, Steve McQueen, John Baldessari, Rem Koolhaas, Herzog & de Meuron, Rotor, Virgilio Sieni, and Massimo Cacciari, among many others. 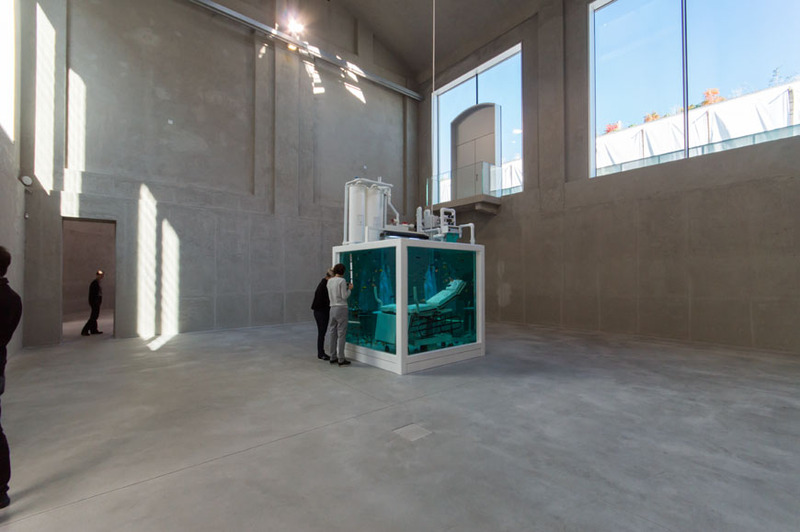 The Fondazione has also a permanent collection constituted of artworks mostly dating to the 20th and 21st century. 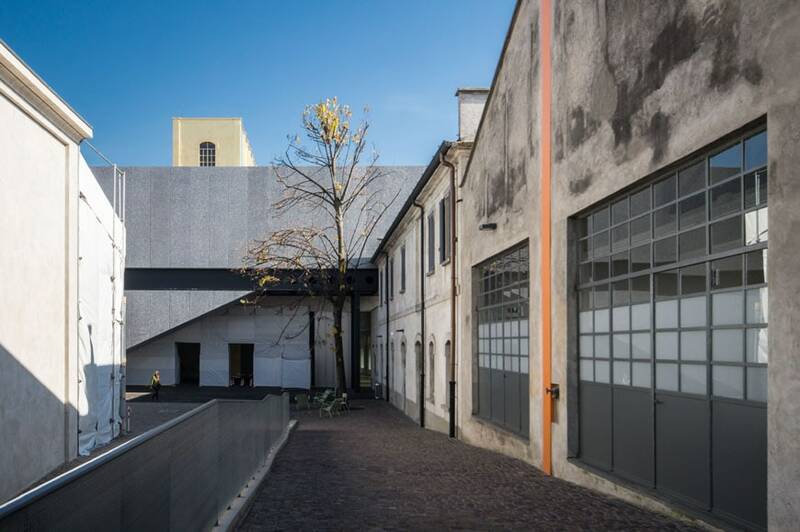 The new home of the Prada Foundation in Milan is a former industrial complex located in the south-eastern part of the city. 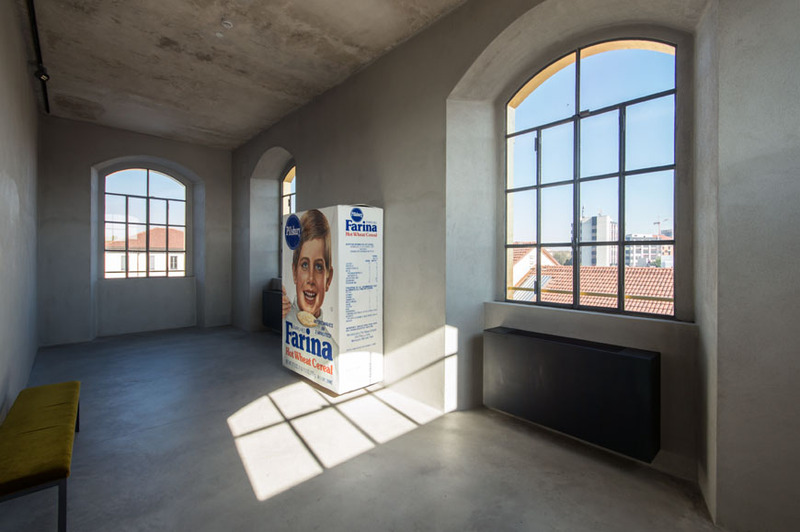 The 1910s complex, formerly the “Società Italiana Spiriti” distillery, is composed of various buildings, once used for warehouses, silos, offices, and distillation laboratories. 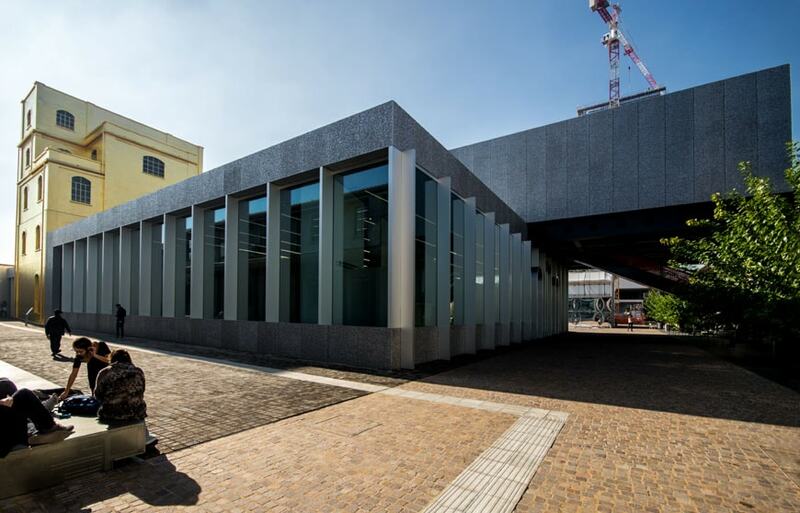 The approach by Koolhaas’ office was to integrate some of the old industrial buildings, opportunely restored, with three brand new structures, called “Podium”, “Cinema” and “Torre”, the last of which is a nine-story tower, still under construction. 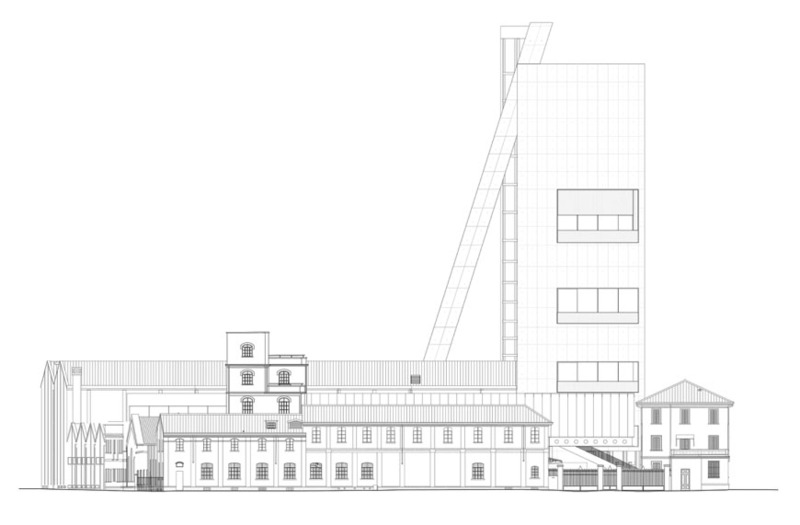 When completed with the large tower, the complex will be one of the largest dedicated to contemporary art in Italy. 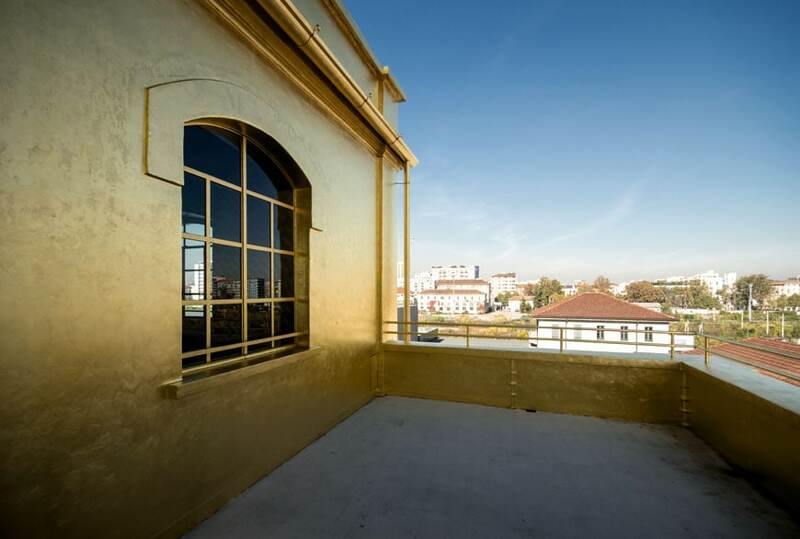 The complex, on a total floor area of 19,000 square meters (205,000 square feet), includes exhibition spaces, offices, a cinema, an archive, a library, a store, and the the old-fashioned “Bar Luce” cafeteria, designed by acclaimed film director Wes Anderson to resemble a typical Milanese bar from the 1950s. 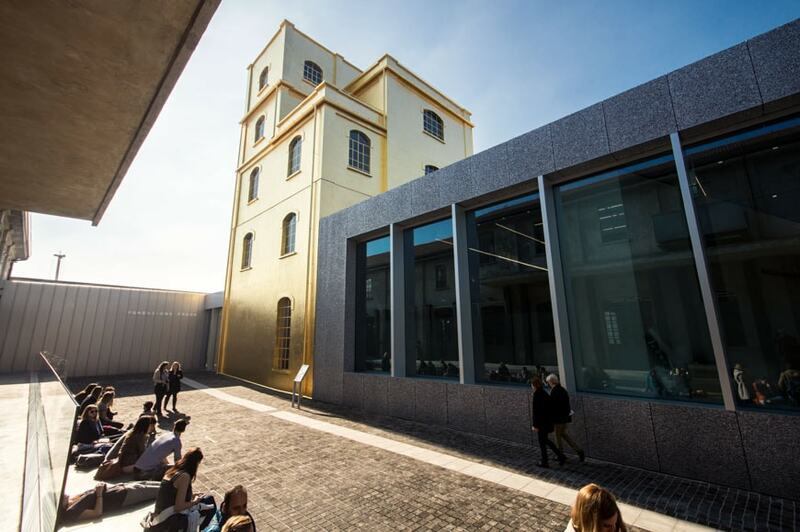 No doubt that, at least until the “Torre” will be completed, the hallmark of the complex is the gold-clad Haunted House, a narrow tower which 4 levels houses a part of the permanent collection of the foundation, with works by Louise Bourgeois and Robert Gober. 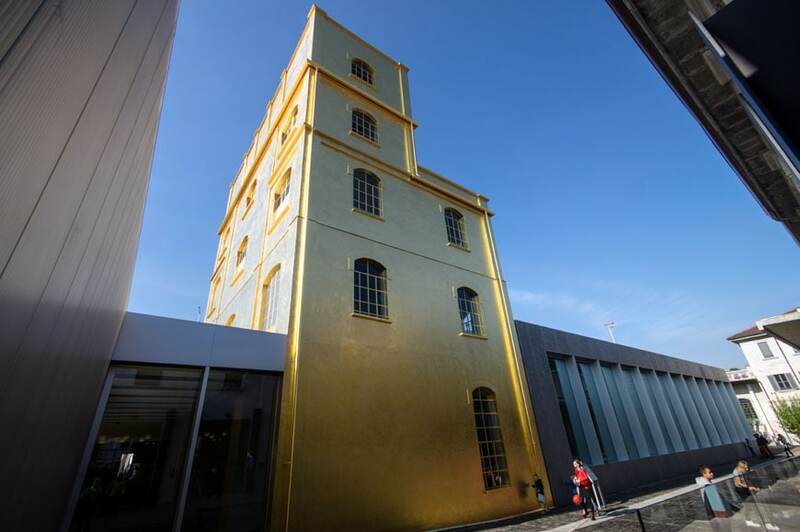 The use of 4 kilograms of 24 carat gold leaf for the tower coating has been subject to criticism and judged by someone a little overbold. Yet, considering the overall minimalist appearance of the building ensemble, which still retains a large part of its original industrial look, the shiny colored finish of the Haunted House doesn’t seem inappropriate to me; the visual contrast it produces is quite effective, indeed. 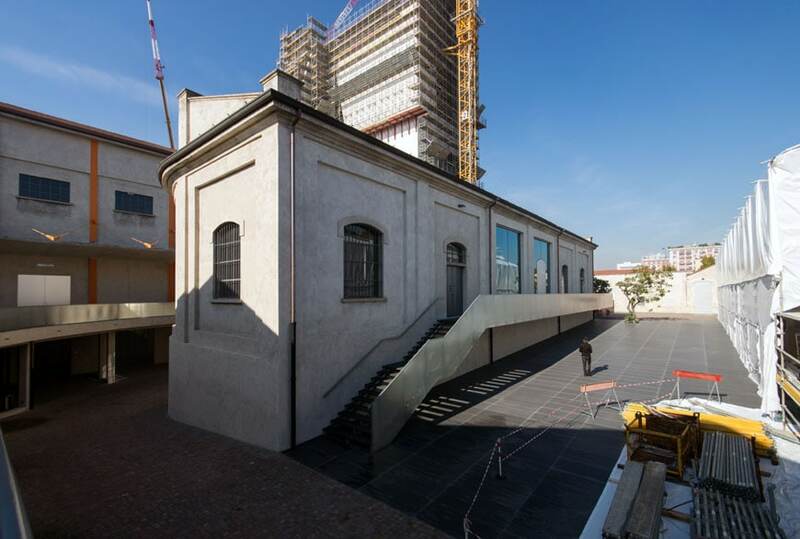 The Prada Foundation’s Milan is composed of an entrance alley, with the library and the bar on one side and the Podium building and the Haunted House on the other, and of an array of constructions which includes the “Cinema”, the “Nord” building, the “Cisterna” (Cistern), the “Sud” gallery, and the large “Deposito” (Depot), the last three used as exhibition spaces, together with the glazed space of the Podium. 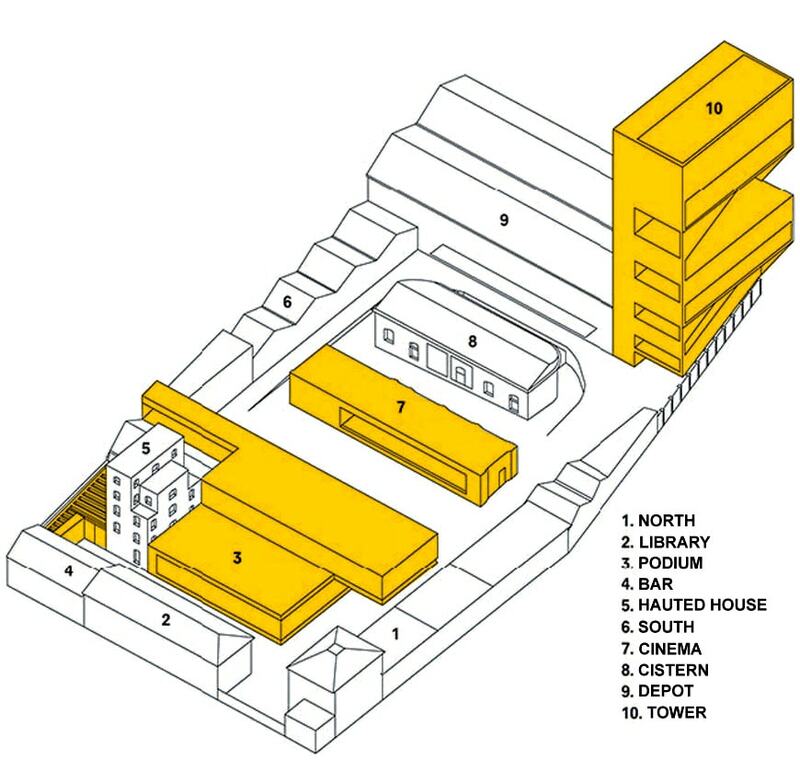 Koolhaas’ objective was to create an ensemble “intended as a collection of artifacts that encounters a collection of architectural typologies”. 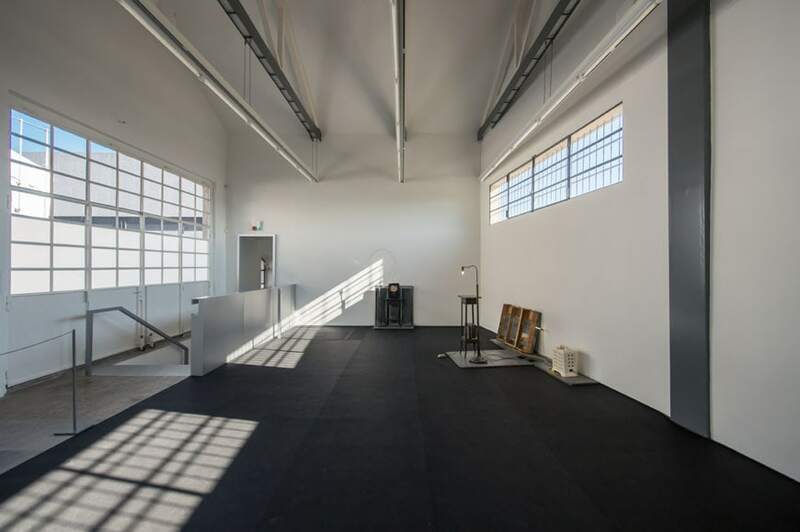 Indeed, the Dutch architect complains that art is usually displayed in a limited repertoire of spatial conditions: neutral galleries, industrial spaces, contemporary museums and art fairs. 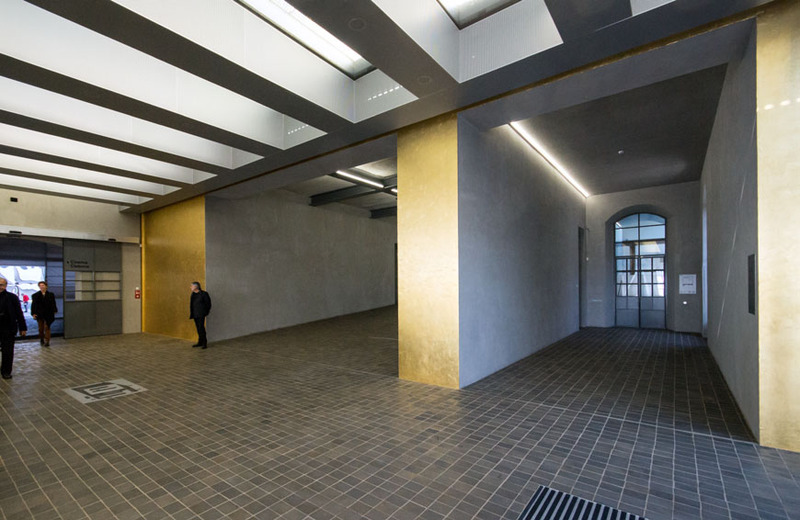 Therefore, Koolhaas designed the exhibition spaces of the Prada Foundation to differ as much as possible from one another: from the small and intimate rooms of the Haunted House to the gigantic Depot hall. 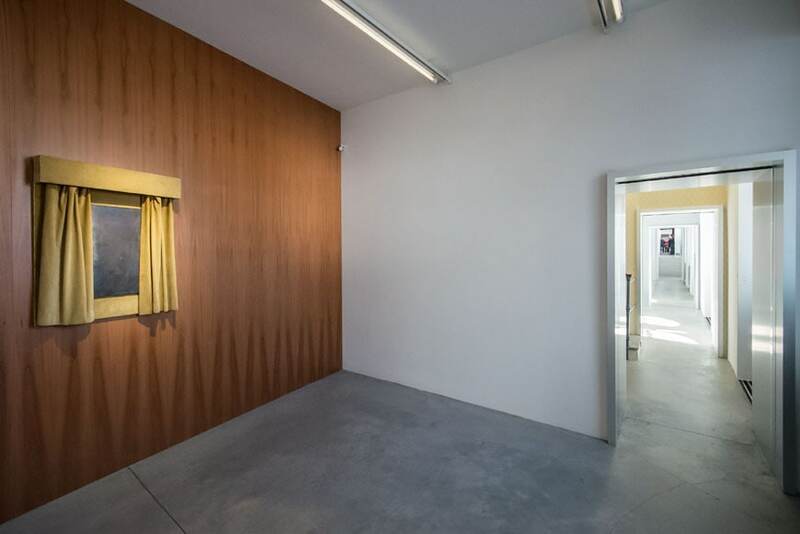 For example, the triangular footprint of the South gallery creates a sequence of progressively larger rooms, no one equal to the successive, and a succession of constantly different spatial contexts for the artworks on view. 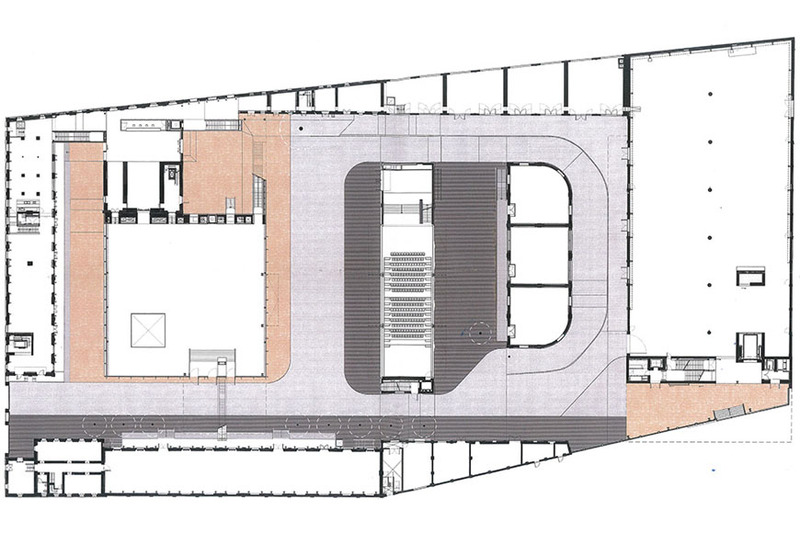 While the building ensemble is fascinating, the external spaces are not of the same quality, they are somehow too tight and lacking proper green areas, at least so far. 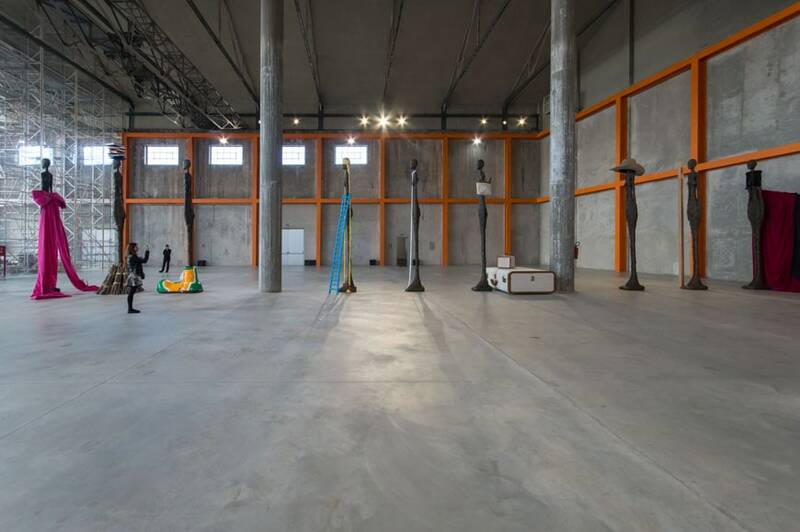 Nevertheless, this should be considered a minor issue for one of the best culture and art centers in Milan.